Turn meal time into nutrition time for your kitty with the Newman's Own Organics Grain-Free 95% Turkey & Liver Dinner Canned Cat Food. 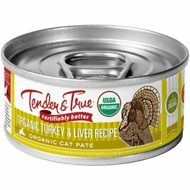 Made with real organic turkey, turkey liver and turkey broth as the top ingredients, it’s all the grain-free nutrition your furry one needs with all the flavor he’ll find irresistible. Your pal will love the juicy pate while he gets all the nutrients he needs, including essential amino acids like taurine, plus vitamins and minerals. It’s great as a complete and balanced diet for cats of all ages and even kittens, and can be used as a meal on its own or a delicious kibble topper. Plus, the broth is a great way to add much-needed hydration to your cat’s diet, and contains no wheat, corn, artificial colors, flavors, or preservatives. 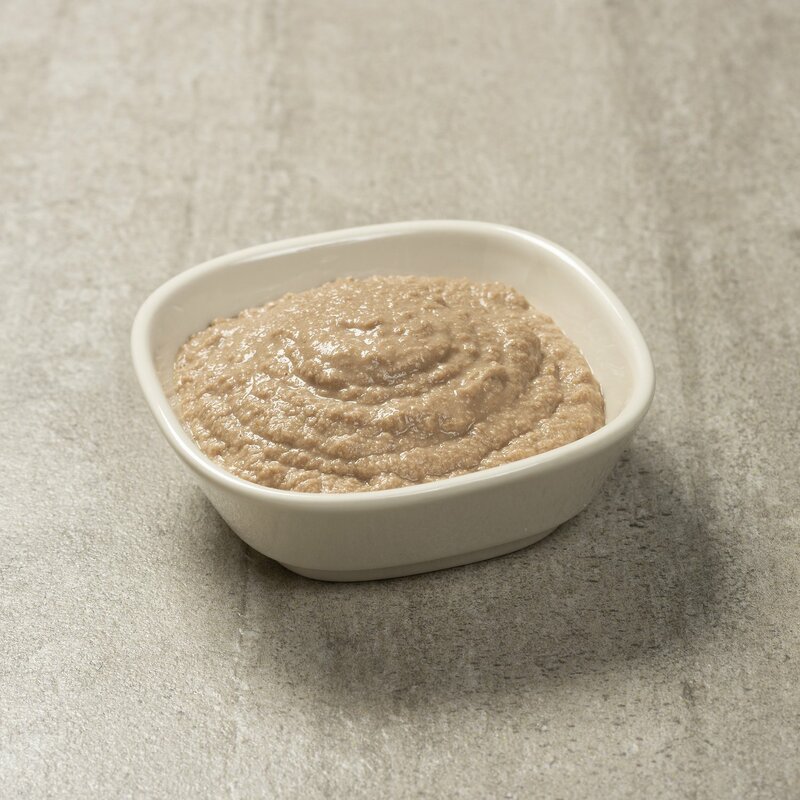 Grain-free pate recipe is made with 95% real organic turkey, turkey liver and turkey broth as the top ingredients. Organic Turkey, Organic Poultry Broth, Organic Turkey Liver, Organic Yeast Extract, Calcium Carbonate, Dicalcium Phosphate, Potassium Chloride, Organic Guar Gum, Carrageenan, Choline Chloride, Taurine, Salt, Magnesium Proteinate, Zinc Proteinate, Iron Proteinate, Niacin Supplement, Vitamin E Supplement, Copper Proteinate, Sodium Selenite, Thiamine Mononitrate, Manganese Proteinate, Vitamin A Supplement, Calcium Pantothenate, Riboflavin Supplement, Pyridoxine Hydrochloride, Biotin, Vitamin D3 Supplement, Vitamin B12 Supplement, Ethylenediamine Dihydroiodide, Folic Acid. It would get 5 stars but there are three things that stop it. It smells a little too much like the cheaper canned cat food brands, it's not non-GMO and the cans are not completely filled. Otherwise, my cats like it and I hope to NEVER find foreign objects in these cans of food like I did with Oranix and Whole Earth Farms. I use to purchase another brand of organic cat food and my cats liked it but it was never consistent one can would be moist and the next can chalky sometimes the cans had chunks of green stuff in them so I figured it was a time for a change. I'm really glad I switched over to Newman's Own, it's not smelly like the other brand and it's alway moist plus the can rinses clean with just a little water the other brand I had to use a scrub brush to get the can clean for recycling. I definitely recommend this brand if you love your little furry friends enough to feed them the very best. 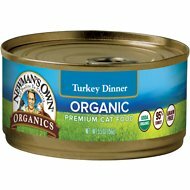 I like that this food is organic, profits benefit non-profit charities, that my cats Love it!, that the nutrition seems to be good for a canned food and smells good. I also feed some commercial raw food and add probiotics. Kitties are doing good on this so far. I was feeding a different food, and I believe that the formula changed, as it looked and smelled different. My Cornish Rex boys, who are voracious eaters, suddenly went off their feed. A friend suggested this brand, and my boys are eating it right up. Glad to find a healthy food that they enjoy. 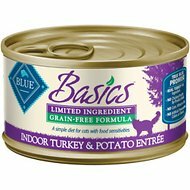 I have 3 cats and they eat this slowly with some coaxing. It is easy to get out of the can and has a nice texture. My cats love Newman's Own cat food. I have tried many different foods and seem to be pleased with Newman's Own. 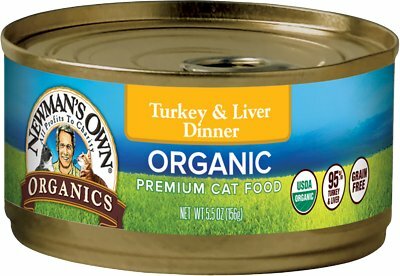 My cats love this organic cat food. I feel confident in what they are getting. My 3 kiddos liked it at first. But a day or two later they nixed it. So now I am stuck with a case of cat food they don’t want. Great service. Great price. Great food. Very happy. Consistency of baby food, bleh, plus my cats arent thrilled w the taste.